[CONFSERVER-26785] Ability to comment on assigned tasks from pages form WorkBox or from viewpage and see the comment/response from the view page - Create and track feature requests for Atlassian products. 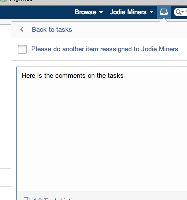 When I add a note to a Task, the note is not shown anywhere else except for in the note box where it was entered. No one else can see this note. There is no history on this note. The note is not shown on the Task list itself. If the user assigned to the Task asks a question of the user who assigned the task, there is no way they would know about it. They get no notification, it is not displayed anywhere and they can't do a mention in the note to add a notification. Even in workbox there is no indication that there is a note on any one of the tasks - you have to go to the note box to see it. I would suggest that all note on the Tasks appear as note on the page (or in the comments section on the page), have the ability to do @mentions AND have a link back to the Task itself.